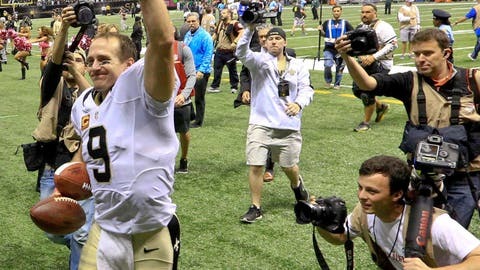 Drew Brees not only hit touchdown No. 400 on Sunday, but he officially became the youngest quarterback to do it. When Drew Brees threw touchdown No. 400, the man did it in fashion. There’s no better way than to hit a milestone like career touchdown number 400, than by throwing it in overtime to lock up a victory. Even better than that, Brees’ milestone touchdown went for 80 yards to running back C.J. Spiller. For those who are curious how Brees stacks up against the rest of the NFL in terms of the race to No. 400, well, he’s now the youngest QB to ever do it, according to the team’s official Twitter. Add Brees’ name to the record books for this one, and put the final touchdown pass in as one of his many great career highlights.